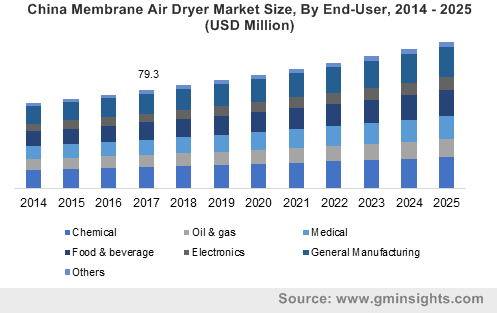 Membrane Air Dryers Market size was estimated over USD 550 million in 2017 and the industry will grow by a CAGR of more than 4% up to 2025. Increasing number of chronic diseases across the globe has led to developing better diagnostic equipment, where clean and dry compressed air plays an important role. The use of dehumidified air for critical medical purposes such as in ICUs is also increasing with developments in medical science. The use of membrane air dryers in healthcare as well as industrial applications to provide compressed air free from oil, water and other contaminants at dew points as low as –40?C is expected to boost the product demand in coming years. Rapid industrialization due to ease of trade norms and strategic steps taken by government of developing countries has encouraged the membrane air dryer market growth over the past few years. Mexico is one of the fastest developing countries in Latin America and received around USD 29.7 billion of FDI inflow in 2017 according to UNCTAD (United Nations Conference on Trade and Development). In 2018, the country had secured investment of USD 93 billion for exploration of oil & gas. Also, the Mexican government has made major investment plans to boost other industrial sectors in the country. Similar growth trends can be witnessed in several developing countries such as China, India, Southeast Asia, and Brazil, which will contribute towards the growth of various end use industries, thus in turn catapulting the demand for membrane air dryers. The product also has several disadvantages as they can only be used in the low capacity compressed air systems, hence can’t be used for heavy industrial equipment. Sometimes the purge air loss is too high to achieve the desired dew points. Operational issues such fouling of the membranes with oil and moisture may discourage the usage of membrane air dryers and end-users may prefer substitutes for their application requirements, thus hindering the market growth rate over forecast time period. 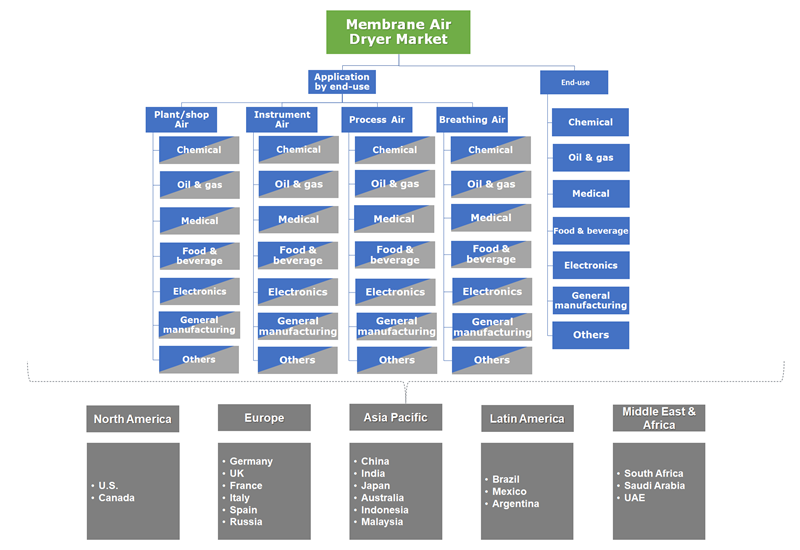 Global membrane air dryer market is segmented into three categories and these include plant air/shop air, instrument air, process air and breathing air. Among these, instrument air segment holds over 40% of the global market. Increasing competition to provide quality product with minimal cost incurred in manufacturing will give an up thrust to the demand for automated precision equipment and instruments. Such factors will contribute towards rise in demand for membrane air dryers for instrument air applications. Based on end-use, chemical sector accounted for close to a fifth of the global membrane air dryer market in 2017, driven by the substantial presence of chemical companies across the globe, especially in Asia Pacific. Most of chemical plants have hazardous environment due to the presence of combustible dusts, vapors, and flammable gases, and the air should be handled carefully. The air required in such applications should be clean, dry and free from moisture. Membrane air dryers are used in applications such as gas storage and dispensing areas, utility gas plants, refineries, etc. Increasing demand for agrochemicals and specialty chemicals for industrial and commercial purposes is bolstering the investment in this sector. Asia Pacific region led the membrane air dryer market more than a third of the global share. The product demand is high in the region due to the significant presence of end-user industries. This region constitutes almost 60% of the global population which is expected to rise steady over the coming years; thus the demand for food & grains will remain significantly high. Growth in the regional food & beverage sector is expected to healthily contribute towards the growth of membrane air dryer demand over the forecast timeframe. Europe also holds a significant share in the overall product market, driven by the high product usage in original equipment manufacturing facilities. Membrane air dryers require lesser maintenance hence they are ideal to be used in analytical and pneumatic controls. With increasing smart manufacturing applications in the region, the growing demand for instrument air will propel the membrane air dryer market in coming years. Some of the prominent players in the membrane air dryer market are Atlas Copco, Donaldson Company, Gardner Denver, Graco Inc., Hankison, Ingersoll-Rand, Parker Hannifin Corporation, SMC Corporation, Pentair plc, Wilkerson Corporation, etc. These players are adopting various growth strategies such as expansion of product range and production capacity through mergers, and joint ventures. They are also expanding their distributor network and are investing in R&D to stay ahead in the membrane air dryer market. Membrane air dryers are predominantly used in various end-use industries such as chemical, general manufacturing, food & beverage, medical, etc. This is due to its several beneficial characteristics such as low cost and easy installation and operating cost, usability in hazardous environment, and lack of moving parts, hence no requirement of electricity. So, these can be easily used in remote locations with no electricity such as in offshore oil rigs, mines, etc. Increasing investment in offshore oil & gas exploration activities due to rising crude prices since last few quarters will increase the demand for membrane air dryers over the forecast timeframe. Ease of doing business due to legislative reformations done in emerging economies will boost the industrial development, which will catapult the overall product demand over forecast timeframe.